Welcome to the Great Aussie Polish Challenge! 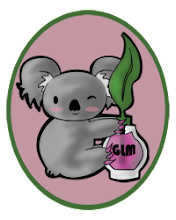 After all the fun of the piCture pOlish Blogfest yesterday a bunch of us Aussie bloggers thought we'd continue the fun with a week of Aussie polishes. They may not all be as well known as piCture pOlish but we do have a surprising range when listed. It's not going to be hard to come up with a weeks worth of brands :) So today is Ulta3 Tuesday. Ulta3 is one of our cheap brands, usually found in dump bins in the chemist or grocery store. It's so easy just to grab a few each time I go shopping and at $2 each it's also something the kids can afford to get me for Mother's Day, Christmas etc. This is Ulta3 Purple Passion. Which one you ask? Both! Yep they are both Purple Passion, not a recycled name but supposed to be the same polish, same name and product code on each. The difference is where they were manufactured. Not so long ago the Ulta3 production moved to China and a few of the old favourites changed colour in the process. You'll probably come across other Aussie bloggers referring the AU or PRC version when they talk Ulta3. On my index and ring fingers I have the 'made in Australia' version and on my middle and pinky fingers I have the 'made in PRC' version. The original Purple Passion is a gorgeous colour, with a really eye catching pearly finish, that's mother of pearl sort of shimmer not streaky pearl polish. Unfortunately I didn't have enough light for photos so these are taken with flash which makes the colour look quite flat. It's quite a sheer polish, each of these is 3 coats but the PRC version would be OK with 2 thick coats. The PRC version is also more of a streaky pearl finish, less forgiving with brush strokes and not what I would call purple, it's an in your face fuchsia. Which do I like best? The original is an old favourite of mine, I like the pink version too but it doesn't have that special look that the AU version does in natural light. So here's the differences... The made in Australia version is a 13.5ml bottle and the made in PRC version is 13ml. That's good to know when you're reading a blog review of an Ulta3 polish. If they don't mention which it is you can easily tell from the bottle shot, front or back. Assuming there's a bottle shot. BTW is there any point me taking bottle shots for my blog or does everyone already know what the bottles look like and just want to see the nails? Let me know in the comments please if my bottle shots are just boring filler. From the back they are clearly labeled with made in .... So if you're hunting for a particular Ulta3 colour it's worth looking for both versions just in case there's a difference. In general the PRC versions are more heavily pigmented, meaning less coats needed and better for stamping. The PRC Black Satin is a great basic single coat black which I use most often under my multichromes and for testing most of my sheer polishes over black on a nail wheel, and the PRC Lily White is the closest I've found to a single coat white. I have a few bottles of each in my basic nail supplies. The PRC versions are prone to faulty brushes though so it's worth opening them up and having a look at the brush before buying. If your brush looks like this you should probably pick another bottle. Here's the rest of the Great Aussie Polish Challenge girls. We wont all have the same brand each day but most of us did Ulta3 today. There's more brands than we can cover in a week if we all stick to the same ones so you'll see more variety tomorrow and get to see a good range of Aussie polishes. 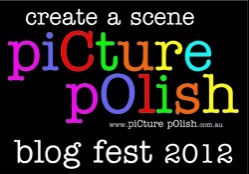 Finally it's time for the piCture pOlish Blogfest 2012! I feel like I have been waiting so long for this. I am thrilled to be part of this. piCture pOlish is my favourite Australian polish brand (big call I know because we have some fabulous Aussie brands). I think I have more bottles of piCture pOlish than any other brand in my collection, over 30 of them now. Warning mega photo spam approaching! I took sooooo many photos but I have tried to cut them down a little. The piCture pOlishes I received are Orbit - the perfect travel partner! 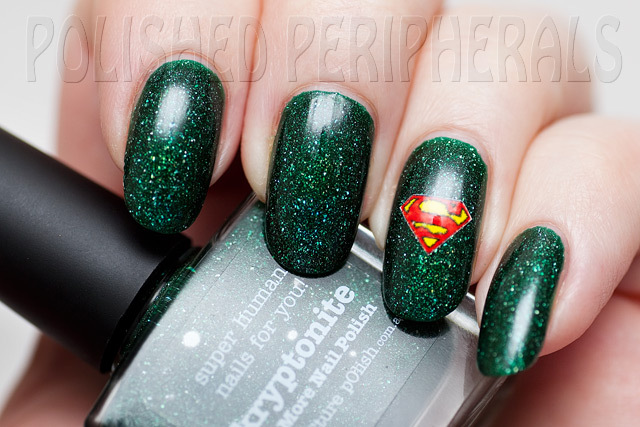 and Kryptonite - super human nails for you! I'm quite fond of the piCture pOlish bottles. They are a nice solid rectangular shape, 11ml with good brushes and a nice soft touch grippy lid that's easy to open with slippery hand cream covered hands :) They also have a QR label on the side which you can scan and it takes you straight to piCture pOlish on-line. I haven't been able to test this because I don't have an internet enabled mobile phone but it sounds pretty cool. 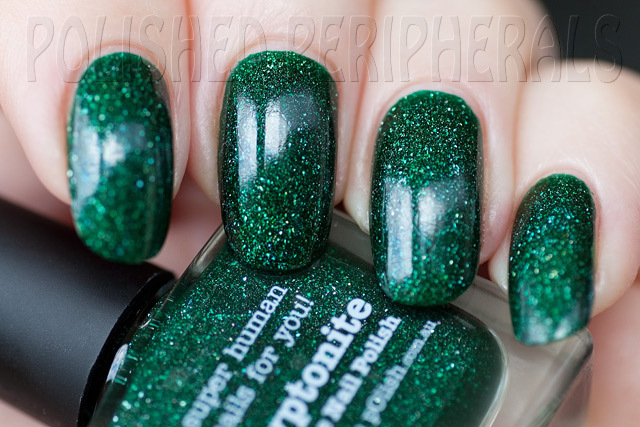 Kryptonite is stunning! 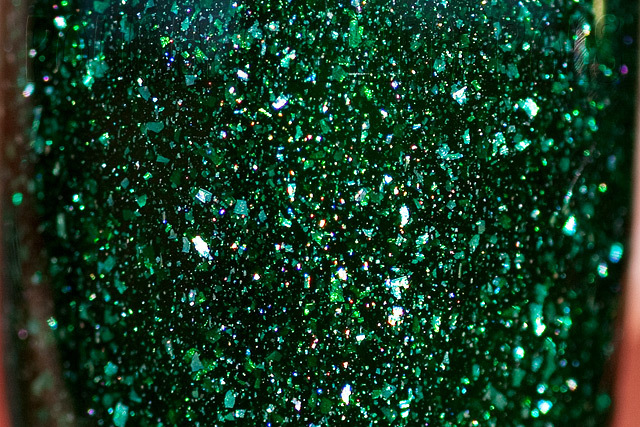 It's a dark emerald green jelly with large scattered holographic particles that were hard to photograph. It's unique to me, I have nothing similar in my collection. The green jelly looks perfectly squishable and the holo sparkles and dances through the jelly. It's perfectly named too. 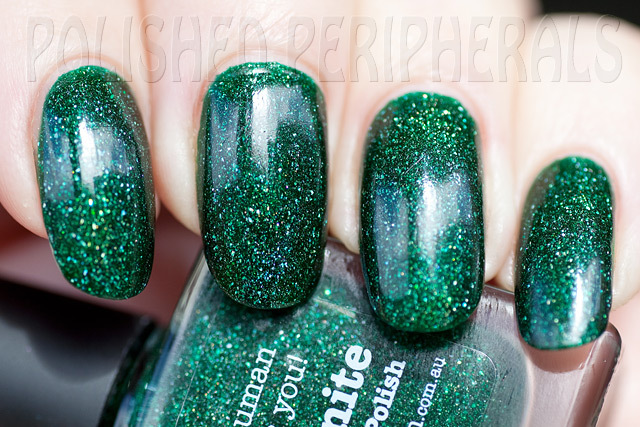 Green polish is my kryptonite, it's the first colour I look for in any collection and I seem to be forever searching for the perfect green, especially a green holo! 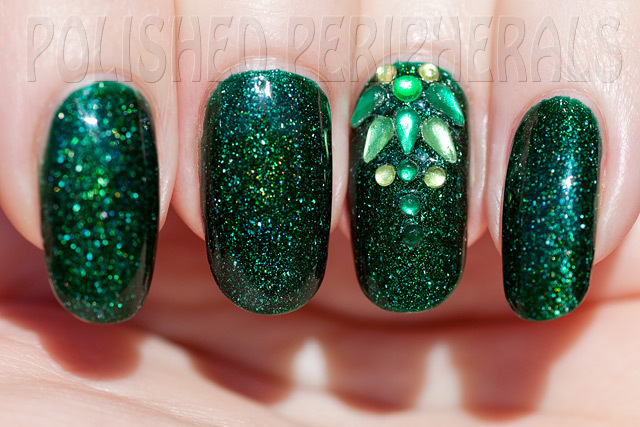 Now I think I not only have the perfect green holo but it's the most perfect polish ever! This polish was the perfect pick for me :) How many times can I say perfect in one paragraph? I wore this for a week and couldn't stop staring at it. I think I drove my poor husband a little crazy with the number of times I said things like 'OMG this polish is amazing' and made him look at it under different lights. It's so shiny and smooth and applied perfectly! These photos show two coats with no top coat. It didn't need a top coat to shine. Of course the sun ran away as soon as I put it on so these photos are taken on day two, still no sun and some scratches across the surface from things like washing up. Guess that's a good reason to wear a top coat. These were taken outdoors on an overcast day. Of course being Kryptonite I wanted to do some Superman (woman) inspired nail art so I printed up some little super logo water decals. Unfortunately the ink wouldn't dry and bled on the paper and then the transfers wouldn't stick. Maybe the paper has a use by date. It worked great the last time I used it. My little super logo didn't stay on long so I decided to try make some Kryptonite crystals with some nail art 'gems' I have, and cover with a top coat. That weird green lump I'm holding is raw unpolished Australian malachite, the closest I have to kryptonite. I think my Kryptonite crystals ended up more like dragon scales. Look at the density of the holo particles. You can see they're like little shreds or flakes rather than glitter. Stunning! I was worried that Kryptonite would be a stainer because I've found that well pigmented dark greens can stain. I was very careful with removal to wipe it off towards the tip of my nails to keep it off my skin so ended up with only minor colour on my cuticles that washed off easily. Same with my nails, only a hint of green remained through the base coat and that washed off leaving just the yellow staining courtesy of the Orly Glitz I wore a few weeks ago. 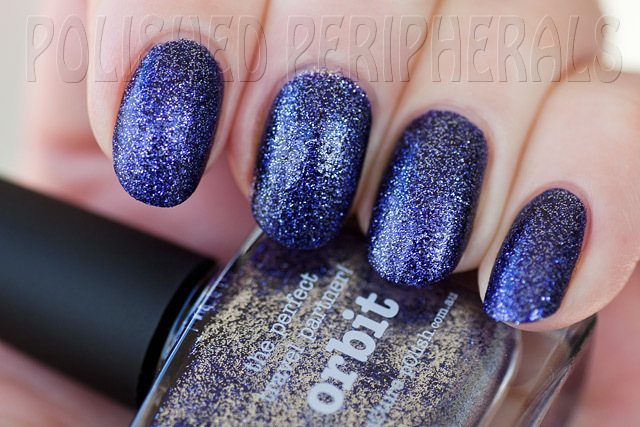 The other colour I received is Orbit, (yep I shortened my nails quite a bit between polishes). 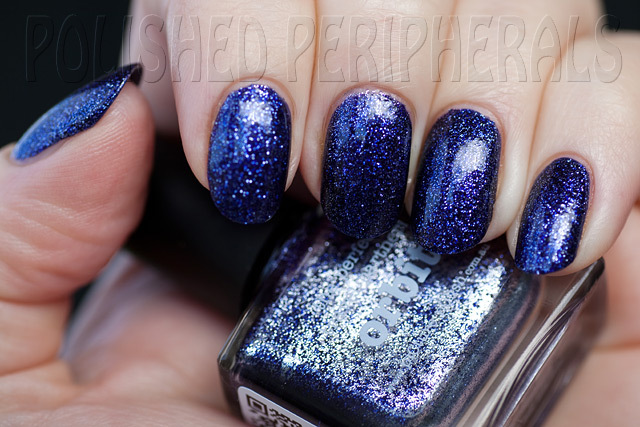 Also a perfect choice for me because blue is the second colour I always look for in a collection. This is one of the 'Mesh' shades. I was worried that after wearing Kryptonite for a week Orbit would be a let down but nope, it's another wow polish that had me staring and turning my hands to catch all the angles and light. 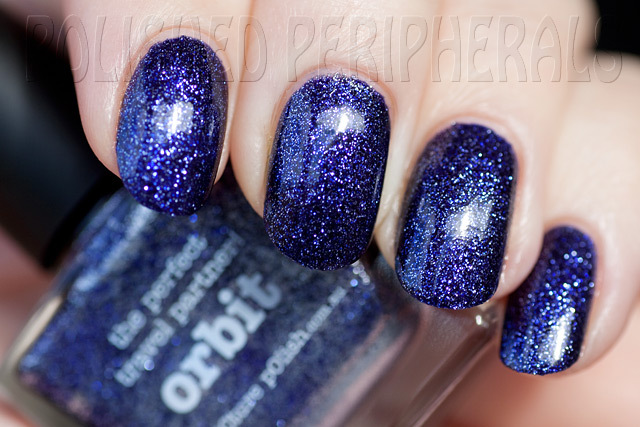 Orbit is a dark blue jelly polish, jam packed silver micro glitter. 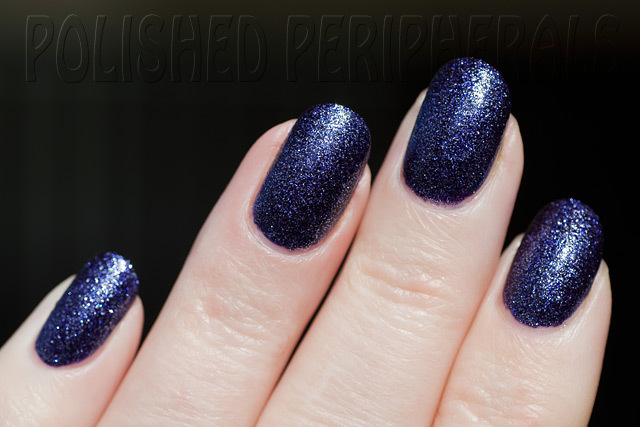 The jelly finish lets the glitter shine through and tints it blue in the lower layer so there's a great deal of sparkle, depth, and it looks like a mix of blue and silver glitter. Look at that glitter! This is two coats without a top coat. It dries to a rough finish which is easily glossed over with a top coat but I wanted to take photos of the finish before I added the top coat. 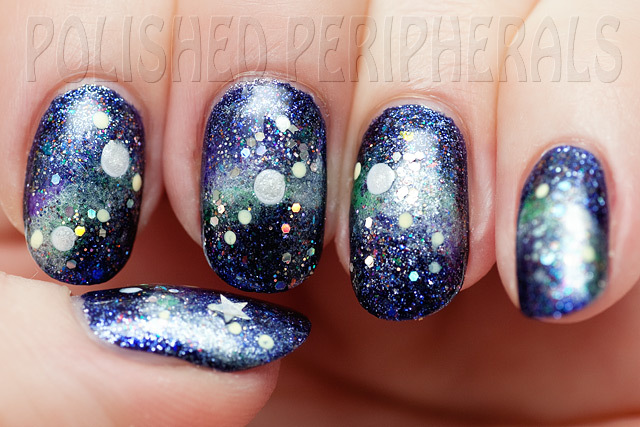 The top coat added even more depth to the glitter. I used a thin top coat, Essie To Dry For, and it's smooth without the bulk of something like Seche Vite or Essie Good to Go. It's mesmerizing! This is two coats. It's perfectly opaque in one coat but I applied it a bit too thin on my thumb and index finger so added a second coat to all nails. I find it takes me two nails to get a feel for a polish, how much to load up the brush, how quickly to work etc, so it's always the thumb and index finger of my left hand that gets the worse coating. On the brush Orbit looked really thick, so thick the brush looked swollen with it, so I thought it would be difficult to apply but it ended up being smooth and easy. Pretty perfect actually. 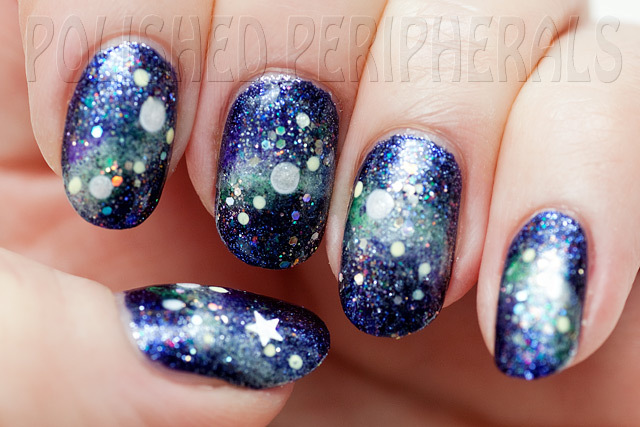 I thought Orbit looked like a sky full of stars so I decided to try some Galaxy nail art. I've seen pics of this sort of thing around the interwebs but never tried it myself so I grabbed a bunch of my piCture pOlish colours, a dotting tool and a make up sponge and went for it. What do you think? All piCture pOlish except the star which is from my franken glitter supplies. 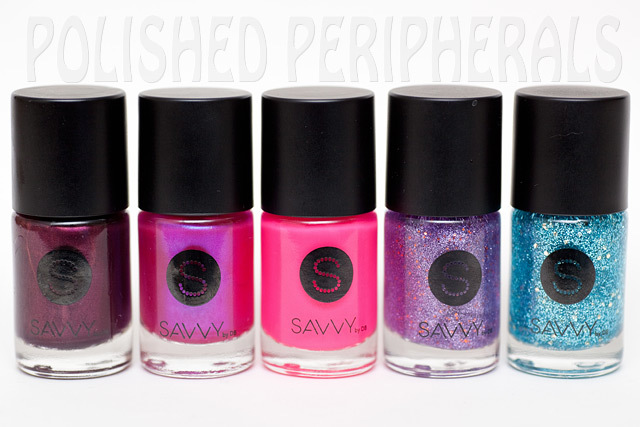 These are the polishes I used to make my galaxy. Sorry some of them are discontinued shades. All of the new shades are available to purchase now from piCture pOlish on-line or their international Network Members. I think I'm going to need them all! You can also find piCture pOlish on Twitter, Facebook and Pinterest. I'm going to be keeping an eye on the facebook page to see the other blog reviews. Thank you piCture pOlish! 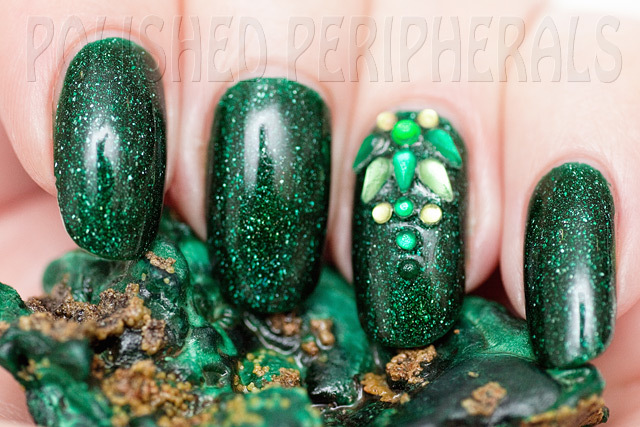 These polishes are gorgeous and I've had so much fun playing with and photographing them. So after all that, this is the perfect way to kick off The Great Aussie Polish Challenge where a bunch of us Aussie bloggers will be featuring Australian brand polishes for a week. Come back tomorrow and I'll have a list of participating bloggers and my next Aussie polish. Happy Glitter Me Up Friday! OK so it's Saturday now but it was worth waiting for some sun today to take these photos :) It's really quite disappointing when I put on an amazing sparkly polish and there's no sun for photos. I can use flash but I much prefer daylight photos. This is Hello Kitty Violet Salome. It's the only Hello Kitty product I have but I'm so impressed I'm going to have a look for some more. I just remembered I have a stamping plate somewhere with a Hello Kitty image. I'll have to give it a try but I'm pretty bad at stamping. Violet Salome is a really fine micro purple glitter. It looks like a glass flecked foil on my nails but it is really a glitter, I checked with a magnifying glass :) It has a lovely duochrome effect in the bottle that unfortunately doesn't show on my nails. 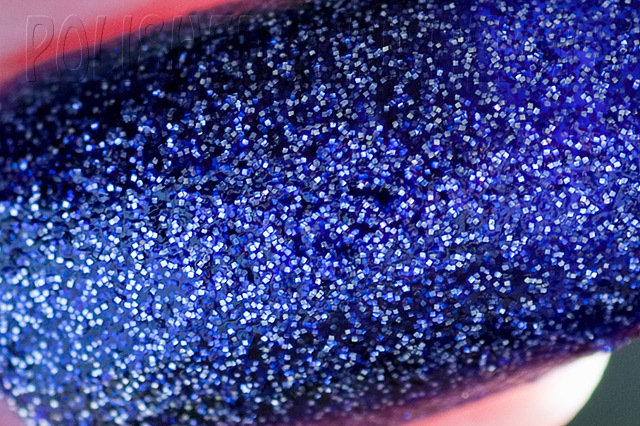 This glitter actually reminds me a lot of the TKB Star Bites powders. It's such a gorgeous purple. Depending on the light it can look burple or almost fuchsia. This is 3 coats with base and top coat. It dries smooth and shiny but chipped on one nail (right hand) within a few hours. Hello Kitty Violet Salome is a tiny 8ml bottle. I picked this up from Priceline on sale. Look at those colours! Happy Glitter Me Up Friday and Happy Birthday Babe! It's my husbands 40th birthday today and I have sparkly nails for the occasion. I think it looks a bit like 40 lit candles on a caramel mud cake (his favourite). Not that we had 40 candles or cake today, we're celebrating tomorrow. This is two normal coats over my base colour. It went on smoothly with no need to fish or dab the glitter. I liked the look with just one coat of glitter but for today's nails I wanted two coats of bling. 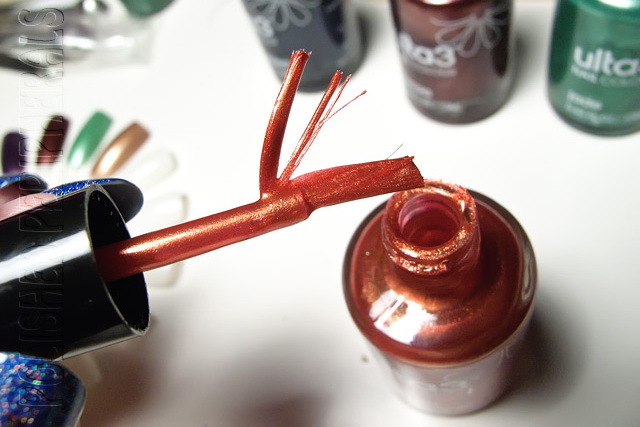 You could easily build up more layers of glitter too without much bulk. The glitter sits nice and flat and I finished with a coat of Seche Vite. This is seven coats all together with base coat, 'underwear' colour, glitter and top coat and it doesn't feel thick or lumpy. For my base colour I started with two thin coats of Orly Glitz. 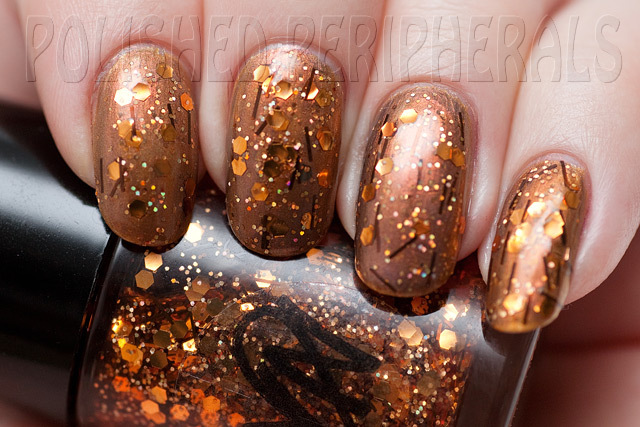 Glitz is a beautiful shimmery gold. It seemed to take a long time for each coat to dry though. It was still dentable when I took these photos and I didn't realise until I hit my little finger nail with the lens cap. This was too brassy for the look I wanted though so I layered Glitz with one coat of Layla Metal Sense #11. The Layla is a soft silver grey to copper pink duochrome but it's quite sheer so one coat over Glitz was enough to turn the gold into rose gold. I applied it a bit too thickly on my ring finger and you can see the difference just the thickness of the polish makes with more pinkiness and less gold showing through. Just a quick post because things are flat out here. My parents get back from 3 months in Sweden tomorrow so I'm having a 'spring' clean to make sure everything is spotless. We'll be bringing them back here to pick up their cat, give Dad his birthday pressies etc before taking them over to their house. We've hired a van to pick them up from the airport so we can all fit. Unfortunately the van has turned out to be filthy and shabby so we wont be traveling in style. If we'd known what condition it was in earlier we would have hired one from somewhere else. At least I wont feel too bad about the kids eating their breakfast in the van on the way to the airport. We also have a special delivery coming tomorrow which will involve posing for photos of us receiving it. I won something and they want to take a photo when they bring it. The kids are very excited :) So it's a big day tomorrow and I still need to mop the floor. It's also my husband's 40th on Friday so I've been making (and eating) practice birthday cakes. Tonight we will indulge in some chocolate and caramel layer cake (2 layers of each) while we wait for the floor to dry. This is Devil's Punch from Savvy by DB. I picked this up from Priceline a few weeks ago for something like $2.99. Actually I grabbed a few colours :) From the left it's Sangria, Devil's Punch, Tickled Pink, Purple Viking and Blue Bayou. Devil's Punch is a gorgeous fuchsia pink with a blue/purple pearl effect. The fuchsia didn't look so great on me but in low light, when it turned purple, I loved it. I took a lot of photos to try and catch the purple colour. Unfortunately it showed best in low light which meant taking slow shots without flash so the purple shots are blurry. Hard to believe it's the same colour right? 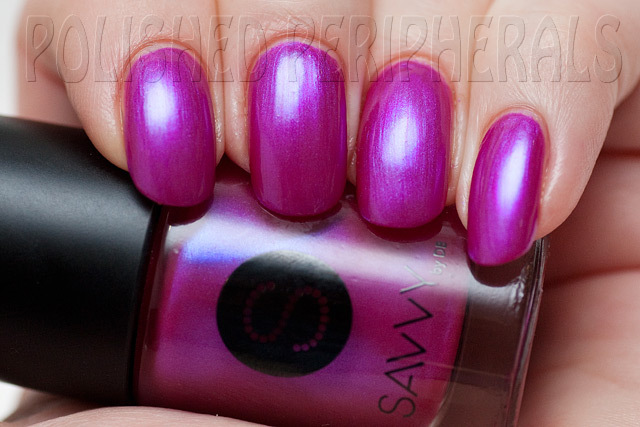 You can also layer Devil's Punch over black or a dark polish to bring out the purple. I might try a black base next time. This has lasted me 5 days now with no chipping. I had planned on doing something new for tomorrow but half expected to lose a nail or two while cleaning today so I haven't changed my polish yet. Now I'm almost done for the night and (touch wood) my nails are intact and I don't even have any chips. So I really don't have any reason to change my polish, it looks great except for the growth gap and I'm better off getting some sleep before heading out at dawn for the trip to the airport.